See how different fungicide regimes performed against early blight and white mold for disease control, yield, and economic return. We utilized four applications on Russet Burbank to evaluate the impact of fungicide programs on early blight control. We reduced our foliar nitrogen applications in order to exaggerate the effect of early blight. In summary, many programs provided adequate early blight control. 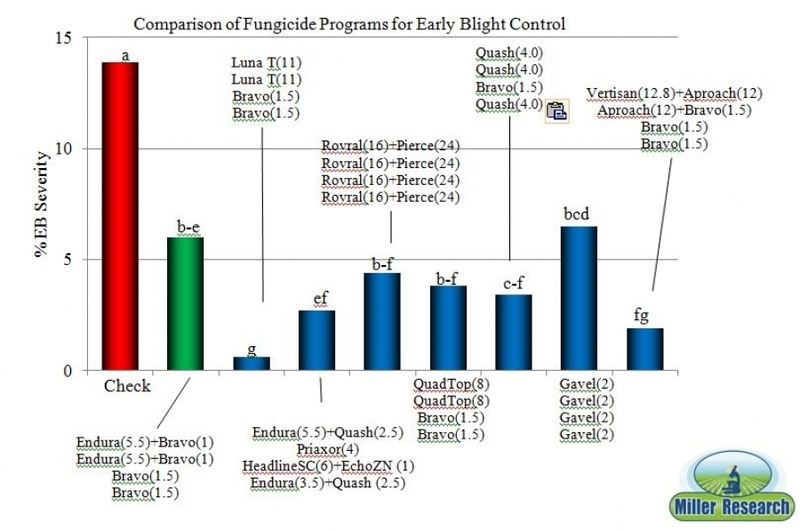 However, programs with Luna Tranquility provided the highest degree of both early blight and white mold control. When Endura was first introduced it was highly effective on these two diseases. In recent years early blight control has been compromised because of fungicide resistance of the early blight pathogen to boscalid. It is possible that this same thing could happen to Luna Tranquility. Bayer has included Scala as part of Luna Tranquility product to help prevent resistance. Unfortunately, Luna Tranquility may not be an option for Pacific Northwest growers in 2013 due to MRL issues in Pacific Rim countries. Another interesting observation was that programs with Quash increased yield. Quash provided only moderate control of early blight control, moderate increase in plant vigor, and did not control white mold. Yet, total yield was increased. It will be interesting to see if these effects are consistent over more years. Ten programs increased total yield compared to the untreated check (3-4, 9, 11-13, 16, 17, 20, and 26). All three programs with Quash increased yield (12, 16, and 17) despite moderate disease control. The Vertisan/Aproach program (26) increased vigor and yield. The Luna Tranquility and Vertisan/Aproach programs resulted in the most effective early blight control (4, 7, 8, and 26). Ten treatments significantly reduced white mold compared to the untreatedLuna Tranquility (4, 7, and 8), many of the Endura treatments (2-3, 6, 10-11), and Rovral treatments (14 and 15) significantly reduced white mold. No white mold was observed in the Endura/Scala treatment (6). All but one program increased vigor over the untreated check. The Vertisan-Aproach treatment was the most vigorous treatment.